Not only is Tahoe home to the world famous Flume Trail, there are dozens of places for mountain biking on nice, easy rides around the lake basin. If you don't have your own bike bring your own bike there are several bike rental companies around the lake. Unless the Tahoe area has several feet of snow, any season is great for mountain biking around Lake Tahoe. Not only is Tahoe home to the world famous Flume Trail, there are dozens of places for mountain biking on nice, easy rides around the lake basin. It's best if you bring your own bike, and there are several bike rental companies around the lake including Anderson's Bike Rentals in South Tahoe, and the Olympic Bike Shop in North Tahoe. Photos by Reno Tahoe, Scott Hill, and Carol Von Cannon. If you are a dedicated mountain biker who enjoys heights and thrills, the famous Flume Trail will give you the technical challenges and spectacular views you are seeking. The Flume Trail is a moderately difficult one way 14-mile ride along the ridges above the lake. The elevation ranges from 7,000 to 8,100 feet and some areas are very steep and rocky. The Flume Trail shuttle will drop you off at the beginning of the trail and will pick you up after you are finished. Bike rentals and gear are also available. Hot Tip: Get to the trail early for cooler weather and keep an eye out for pedestrians—this is also a popular hiking trail. Flume Trail Bikes offers a shuttle service. Directions: The entrance to the Flume Trail is located just south of Incline Village on Highway 28 at the bottom of Tunnel Creek Road right next to the Tunnel Creek Café. This dedicated bike/pedestrian path is paved and runs 9 miles from Tahoe City to Sugar Pine Point near Meeks Bay. It's great for families who want a scenic ride without traffic. The trail starts at the Truckee River in Tahoe City near Fanny Bridge, and runs along the west side of the lake. Some parts of the trail follow the highway shoulder and residential streets. Hot Tip: You can park your car at various locations around Tahoe City and do the track round trip. Directions: From South Lake Tahoe, drive Highway 89 over Emerald Bay and into Tahoe City on the West Shore. Start the bike path near the Truckee River at Highway 89 and Fairway Drive. This part of the Tahoe City bike path runs north up to Squaw Valley in just under 5 miles. 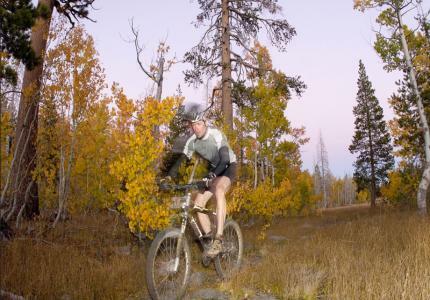 From there, you can also do some mountain biking in the Squaw Valley area. This popular and scenic path runs along the Truckee River, and there are plenty of places to stop for pictures and snack breaks. From Squaw Valley there is a designated bike lane on Highway 89 to West River Road in Truckee. Hot Tip: If you get hot on your ride up to Squaw, take a dip in the cool Truckee River. Directions: From South Lake Tahoe, drive Highway 89 over Emerald Bay and into Tahoe City on the West Shore. Start the bike path near the Truckee River near Fairway Drive and head along Highway 89. This 4 mile paved path in South Lake Tahoe follows Highway 89 and leads west to Emerald Bay. It is a very easy ride that goes past Camp Richardson, Tallac Historical Site, and Fallen Leaf Lake. You can pick up this path in various places including the Tahoe Keys and Rufus Allen Blvd by the South Tahoe Ice Arena. Hot Tip: This path is great for families with small children. Directions: From the Tahoe Keys, you can pick up the path right next to Highway 89. This paved path starts at Highway 50 near El Dorado Beach and connects to other bike trails and lanes throughout the city of South Lake Tahoe, and on into Nevada. Part of the trail bridges over Trout Creek and the Upper Truckee River just south of the Lake and then follows Pioneer Trail near the Lake Tahoe Airport. Hot Tip: This bike path is a dedicated shoulder and lane area on Tahoe back roads. Directions: You can pick up the Pioneer Trail portion of the bike ride from the East Cove area of the Tahoe Keys. There are several short, paved paths that are great for families in the North Tahoe area. A 2.5 mile section runs between Lakeshore Drive and the old Ponderosa Ranch. Another 2 mile sections runs between Sierra Nevada College and the lake. Finally, another 2.5 mile long paved trail starts at Gateway Park on Hwy. 28 and follows the shore of Lake Tahoe passing by several beautiful estates. The trail ends at the top of Hwy 28 and connects with several mountain bike trails. Hot Tip: There are a lot of great restaurants, bars, coffee shops and hotels in this area for refreshment stops. Directions: From South Lake Tahoe, take Highway 50 north to the junction of Highway 28 that leads into Incline Village. There are several places where you can park your car including the Hyatt Regency on Country Club Drive. If you are a dedicated rider who wants more of a challenge, the popular 75 mile Triangle loop is for you. This ride goes along highway shoulders and some paths, so watch for traffic. The route starts in Truckee and continues south on Highway 89 into Tahoe City. Head east (left) on Highway 28 to Kings Beach, following the narrow shoulder on the lake shore for much of the ride. Head north (left) on Highway 267 at the traffic light and ride the steady climb up Brockway Summit. Follow 267 back into Truckee. Hot Tip: Side trips off this trail can be taken at Squaw Valley and Alpine Meadows along Highway 89. The name of this ride says it all. Mr. Toad's is a classic Tahoe mountain bike ride for advanced bikers; it is steep and technical with some hair-raising corners. This 10-mile ride begins at the Big Meadow Trailhead, and heads North on the Tahoe Rim Trail, and descends down the Saxon Creek Trail. Mr. Toad's Wild Ride plunges downhill at a drop of nearly 1,500 feet in less than six miles. Hot Tip: This trail can get very slippery if it's been wet. Bring your helmet. Directions: To reach the Big Meadow trailhead take Highway 89 5.3 miles S of junction with Hwy 50 in Meyers. The Tahoe Pyramid Bikeway is still in the works, and it is already one of the best bike paths in the area. It officially starts at the California/Nevada border, follows the Truckee River and goes to Pyramid Lake in the Nevada desert. Some portions of the trail are unfinished, but the ride from Verdi to East Sparks is smooth and fun along a dedicated paved path. Hot Tip: Part of the path takes you through downtown Reno where you can stop for drinks and food at various restaurants. Directions: The trail can be picked up in various locations, but the closest to Truckee is Crystal Peak Park in Verdi. From Truckee, take Highway 80 East until a few miles before Reno. Take the 3rd Street Exit and drive Northeast until you see the signs for Crystal Peak Park. Power Line is a great mountain biking trail for beginners. This 7.0 mile long trail takes you from South Lake Tahoe through pine forests and over creeks. It's fairly flat and easy, and connects to other trails, such as Corral, Cedar, and Cold Creek Trail. Keep an eye on the signs, and you'll find it easy to keep your bearings. Hot Tip: This trail runs along Private lands, so stay on the trail. Directions: This ride begins at the top of Ski Run Blvd, at the end of Saddle Road. Go all the way up Ski Run turning right on Saddle. Be sure to obey the parking restrictions as the police will ticket here. Follow the signs to the trailhead.